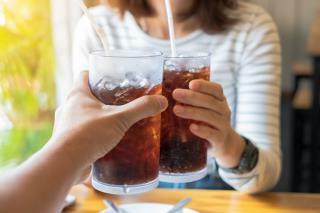 (Newser) – Guzzling diet soft drinks may seem like an easy workaround if you can't kick soda but want to fend off health problems spurred by sugar. A new study presented at the Experimental Biology conference over the weekend suggests otherwise—specifically when it comes to diseases like Type 2 diabetes. Gizmodo reports on research presented by Brian Hoffmann and his team, which carried out what a press release says is the largest study yet to follow the body's biochemical changes after consumption of both sugar and artificial sweeteners. For three weeks, scientists fed rats either high doses of fructose and glucose (two natural sugars), or the zero-calorie artificial sweeteners aspartame and acesulfame potassium. In the end, all the rats exhibited biochemical changes in their blood that are often seen as precursors to diabetes and obesity. Can we still have Stevia or not? Frankly, you can find yes or no answers to any food. They really should have to have solid proof before they publish any of this misinformation. This is about aspartame but sucralose was last week. Most of the sodas out here are not good for you diet or otherwise. Don't know who is behind this latest round to discourage people from drinking diet drinks but clearly there is an effort underway. They throw these studies out there that are not peer reviewed. Why not wait until solid data is presented before running stories like this? !